Print Book 618 pages in 1 volume (printed book) with downloadable forms Note: For print books, with MCLE's supplementation service, new supplements and revisions are mailed automatically with an invoice. If you do not want to subscribe, please check the opt out option during checkout. 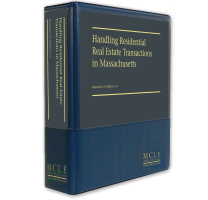 This trusted resource since 1997 offers essential guidance for handling a residential real estate transaction in Massachusetts from start to finish. Practitioners experienced in the residential real estate field take you through all the details—from the initial meeting with your client to the closing table, and every step along the way. Understand the nuts and bolts of the purchase and sale agreement, financing, home inspections and environmental issues, title insurance, and deeds. the various types of tax liens that the Commonwealth can impose on real property. We at MCLE trust that you will find this updated material useful in your daily practice and valuable in keeping your real estate law library current.